Winston's life is dominated by technology, especially web TV. There is no more nature -- all the trees are dead. There is no fixed history: "facts" are changed when they are inconvenient or boring. "Neopostmodernism" has become the official philosophy. Winston works in an office, trying to avoid thinking about his life, since he finds it profoundly unsatisfying. So it's not surprising when he starts finding ways to rebel against the system. He engages in some petty crime, and gets involved with Julia, who is a up-and-coming VP at his company. Together they start to figure out how they are being manipulated by government and corporations. But they underestimate the power of the people in charge, and get into trouble. The plot is not exactly true to Orwell's original story, but it is still complex and interesting, keeping up a fast pace over this 96 page graphic novel. The style of the drawing is crude, but it gets the job done. Although the central idea is serious, Ted Rall balances the theme of corporate government control of the people with a large dose of humor in both the text and the images. At one point, Winston does some computer hacking and rewrites history, making Stiv Bators, in fact a self-destructive punk singer, the 1989 Nobel Peace Prize winner instead. Soon school children around the world are learning this new "fact" in school. 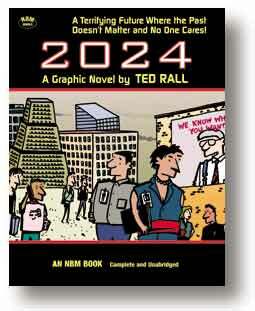 So rather than being an earnest diatribe against modern thought control, 2024 is a fun read. I'm not sure what readership the book is aimed at - it's possible that a few teenagers will pick it up thinking it looks like a fun story and will have their political consciousnesses raised. But it's more likely that it will appeal to cynics in their thirties who know who Stiv Bators was and already harbor grave doubts about the abilities of young people today to think for themselves.